- Pricey - Formed more pimples - Makes skin look more oily This makeup worsen my acne and it was pretty pricey. 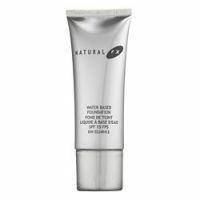 Didn't break me out natural but buildable coverage oil free I found it actually improved my skin over time, my skin eventually started to look flawless without the makeup even on. Moisterizes your skin Helps fight wrinkles looks shiny without powder kind of pricey It's great for people who want a nice coverage without looking like a barbie.